Happy Hump Day Everyone!!! Boy has it been a rough couple of weeks but have no fear I am still around and today I will be bringing you a regional favorite that you may not be aware of if you have never been to the Midwest. Although I haven’t visited my hometown of Dubuque, Iowa in a while, I still remember some of the regions favorites… Taco pizza from Happy Joe’s, Maid Rite Sandwiches, Chicago Style Coney Dogs, and for dessert the Gooey Butter Cake of St. Louis, Missouri. This quirky dessert is a favorite of St. Louisans and according to the area bakeries it is an acquired taste of the locals. I gave it a shot and I must say was surprised at how delicious it is. 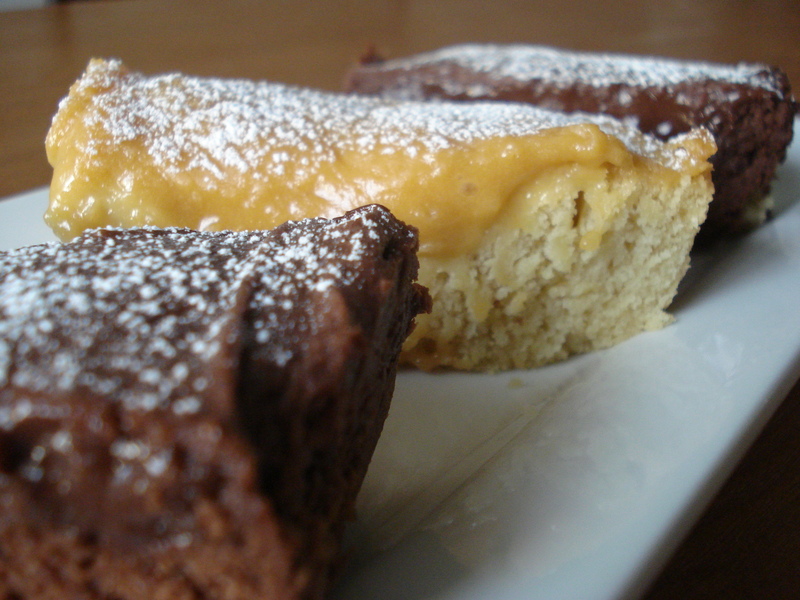 Now there are two different types of Gooey Butter Cake. The first is one with a cake batter/cake mix bottom with the gooey layer up top. This is often found in St. Louis supermarkets, restaurants, and made by the home baker as it is easier than the original. 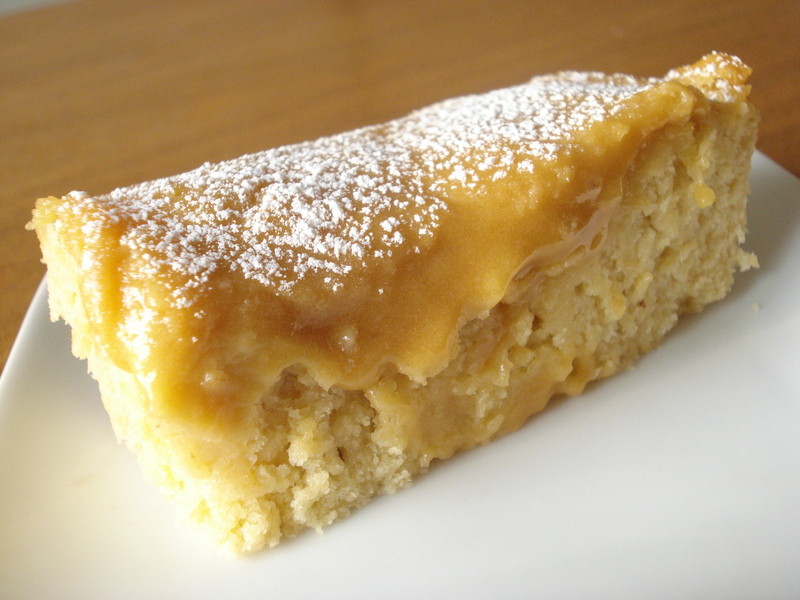 However that type of Gooey Butter Cake is more like a chewy and messy bar cookie rather than a delicious cake. 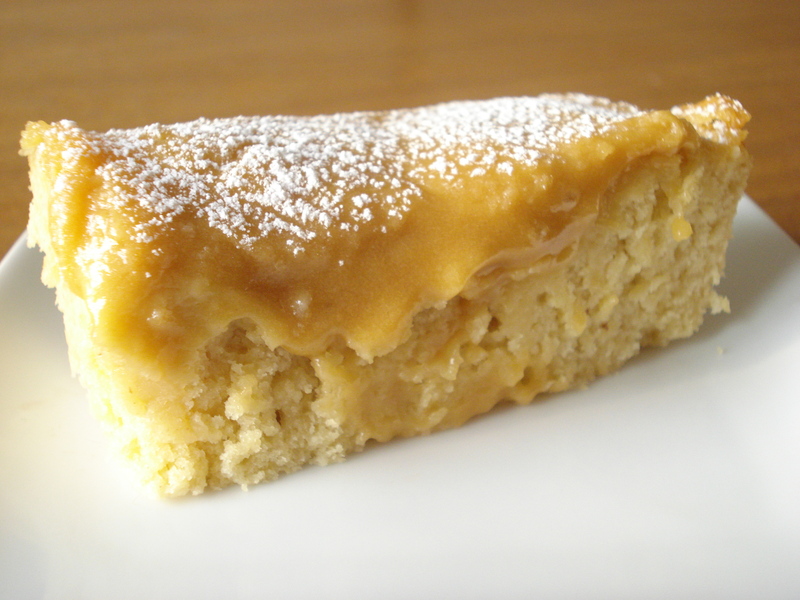 The original formula for Gooey Butter Cake resembles an old-fashioned coffee cake base made up of yeast dough and topped with a gooey custard. The second type of Gooey Butter Cake is the one you see in the photos and is worthy of regional recognition. As popular as the Gooey Butter Cake is it comes as no surprise that there are many claims to its fame in St. Louis. Several bakeries were making it years and years ago but two particular families have their own stories claiming they made the original and all the other bakeries followed suit after it’s popularity peaked. The most accepted origin of the cake is that it occurred by accident in the 1930’s by a German-American St. Louis baker who was attempting to make a regular cake but reversed the proportions of certain ingredients. The bakery owner, John Hoffman, had hired a new baker who certainly messed up the formula and created this concoction. Being that it was during the Great Depression, a little screw up was a big deal and so rather than throw out the large amount of screwed up cake, they decided to sell it. Surprisingly it became a huge hit at the bakery and so then they were forced to try to duplicate it. Once it was duplicated they began selling the Gooey Butter Cake as a staple item of their bakery and other bakeries nearby followed suit, creating St. Louis’ most popular ethnic treat. 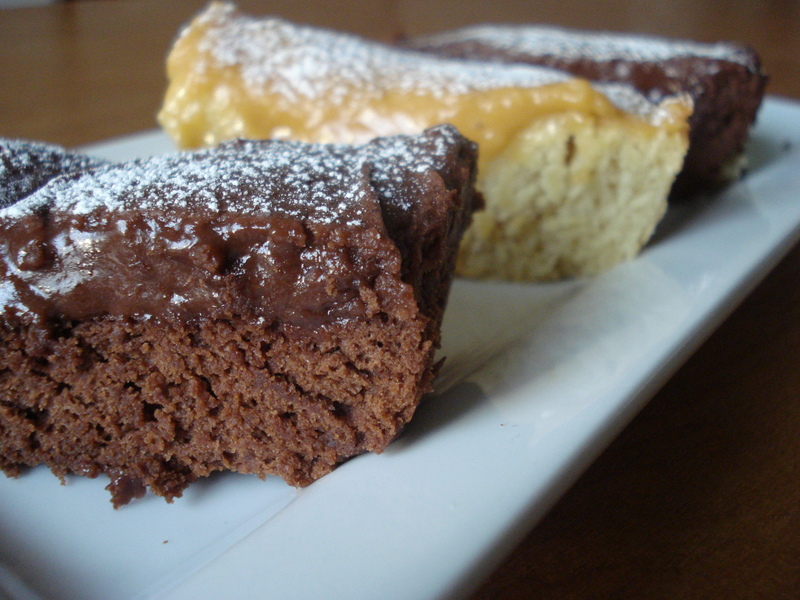 I have chosen two produce two flavors of Gooey Butter Cake, Butterscotch and Chocolate, although there are several more flavors you could experiment with and try. The classic flavor is vanilla and that formula I will provide below. I will also provide the alterations to the original formula so that you can also produce the Butterscotch and Chocolate varieties seen in the photographs. A few quick notes before I leave you… Be sure to remove the cake from the oven when the perimeter is golden brown and the center jiggles when gently shaken. The topping will continue to set up with residual heat as the cake cools. The secret ingredients in this formula that are not exactly traditional but allow ease for the home baker to recreate the original in a snap are light corn syrup and Instant Pudding mixes. These two ingredients quality are crucial. The corn syrup aids in the gooey topping and the instant pudding adds flavor, sweetness, and structure to the gooey topping that would otherwise be much harder to achieve. I suggest using Karo brand corn syrup and Jell-O brand Instant Pudding for best results. For Dough: Adjust the oven rack to the lower-middle position and heat the oven to 200°. When the oven is preheated to 200°, turn it off. Line an 8-in. square baking pan with foil. Grease the foil and a medium sized bowl. In the bowl of a mixer fitted with the paddle attachment, mix milk and yeast on low speed until the yeast dissolves. Add sugar, eggs, vanilla, salt, and flour and mix until combined. Increase the speed to medium-low and add butter, one piece at a time, until incorporated, then continue mixing for 5 minutes. Transfer batter prepared bowl, cover with plastic, and place in the warmed oven. Let the dough rise until it has doubled in size, about 30 minutes. Spread the dough into the prepared pan. Heat oven to 350°. For Topping: In the bowl of a mixer fitted with a paddle attachment, beat the sugar, butter, and cream cheese on medium speed until light and fluffy, about 2 minutes. Reduce speed to low and add corn syrup, egg, and vanilla until combined. Add flour and pudding mix and continue mixing until just incorporated. Portion dollops of topping evenly over batter, then spread into an even layer. Once oven is fully heated, bake until exterior is golden and center of topping is just beginning to color. The center will still jiggle slightly when you shake the pan, about 25 minutes. Cool in the pan at least 3 hours. Use the foil overhang to lift the cake out of the pan. Dust the cake with some confectioner’s sugar. Serve. If the entire cake is not completely consumed at once the cake can be refrigerated for 2 days. Following the formula above make the following adjustments. For the dough, replace 3 tbsp. 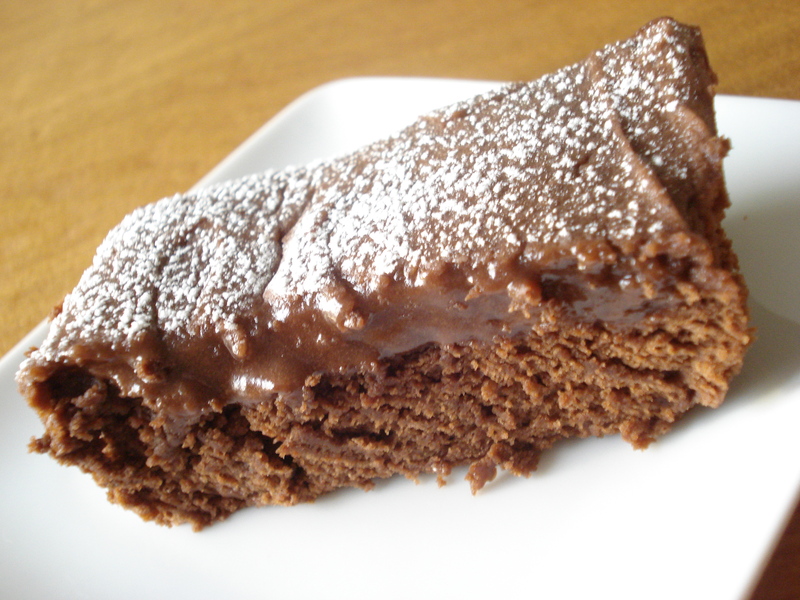 flour with an equal amount of Dutch-Processed Cocoa powder. For the topping, substitute 3 tbsp. instant Chocolate Fudge pudding mix for the vanilla pudding mix. Following the formula above make the following adjustments. For the dough, substitute ¼ cup packed light brown sugar for the granulated sugar. For the topping, substitute 3 tbsp. instant Butterscotch pudding mix for the vanilla pudding mix. Karo Brand Syrup © 2012 ACH Food Companies, Inc.